In our large line of products we are offering an array of Medium Speed Granulator. Widely used in various industries like food and pharma, our products are fabricated using quality-approved raw material. We are engaged in manufacturing and exporting of Plastic scrap grinders and granulators. - Approximate 8" diameter x 12" wide 3 bolt-on blade open rotor. - Tilt back pelican style feed hopper. MAS1 and MAS3 are conventional granulator models equipped with staggered rotor knives: MAS1 with 3 x 3 knives, and MAS3 with 8 x 3 knives. Capacity: 50 kg to 100 kg/hr. - Designed as multifunctional granulator to grind runners & small articles. - Good Grind quality with staggered rotor system. - Low power consumption saving power. - Mounted with high quality alloysteel blades to grind all grades of plastics. - PMS series specialised for TPR, EVA or rubberised Material, Sprues, Runners & Grippers. With our in-depth knowledge of this domain, we are actively engaged in offering an excellent quality assortment of Granulator Machine. 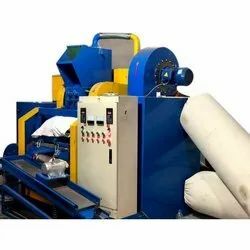 With an objective to fulfill the ever-evolving demands of our clients, we are engaged in offering a wide assortment of Oscillating Granulator Machine. With our vast industrial experience in domain, we are engaged in offering a wide range of Tablet Granulation Machine. The product we offer to the customers is used for making granules of tablet and known for its hassle free performance. We offer product to the customers as per their needs and at industry leading prices.